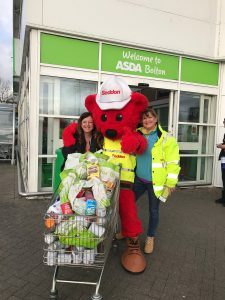 Once a year Asda stores in Astley Bridge, Burnden Park and Middlebrook open their doors for a big food collection for Urban Outreach and each year it gets bigger and bigger! This year we saw people getting involved from Bolton at Home, Bolton FM, Bolton Wanderers, Emis Health, Seddons and our own brilliant volunteers! We even had appearances from Lofty the Lion and Seddy Teddy! This year’s generosity was overwhelming with roughly 100 trays of food collected and over £1000 in monetary donations! Thank you so much for those who came and volunteered and to all of Bolton for their generosity in supporting those who will be accessing Storehouse Foodbank, Storehouse Pantries and Winter Watch over the coming months.